I haven’t bought a car seat for the baby. I don’t have any diapers on hand (although Coco helpfully reminds me every time we go to the store that Baby Sister will need diapers). I don’t have a bed for the baby yet (a bassinet is coming—on loan from a friend). I have a two outfits from when the girls were newborns that I was too sentimental to part with, and a bin of hand me down baby clothes in the basement. I’m not putting together a nursery until baby is here because I don’t have the time or energy at the moment and Baby will sleep in our room for a few months anyway. (I think I’ve decided to move Coco into Zuzu’s room... I may need to invest in a new dresser to make that happen, though). Today I was on the Lands End website, ordering clearance winter coats for the girls to wear next year (super sale prices, plus 5% back through Ebates) and I remembered that as much as I loved the Petunia Picklebottom diaper bag I got at Eliza’s baby shower, my mom gave us a Lands End diaper bag that we used more as the girls got older because it was a little less precious and more like a canvas tote/backpack, so I didn’t mind crumpling it under the stroller. We passed that bag along to my brother and his wife, who now have a two year old and a baby, so it’s still getting used (even though part of the interior lining got ripped because Cooper are goldfish crackers right through the mesh pocket and ziplock bag they were in). I mulled it over a bit, and after I put a couple cute jackets in my cart, I clicked on diaper bags... they had the backpack style that seems to be all the rage right now and it was 40% off with the promo code they were advertising, so... I ordered a diaper bag. I didn’t monogram it because we aren’t 100% settled on The Closer’s name yet. I think we know, but I feel like I need to see her. A lot of people are asking if it will be another C, but of course people who know know that the pattern starts with E... so even though there are a couple C names that made the short list (Clara, Cecilia, and Corinne are all favorites), I think we are going in a different direction. We’d like to do a family name (a boy baby would have been named after each of our maternal grandfathers), so we’ll see if we land where I think we will when The Closer is actually here. The nickname is holding me up a bit... but Zuzu’s nickname came a few months after she was here, so I think maybe Baby will grow into that or it will happen organically? (Coco is hell bent on calling her Rosie Cutie Flower-Petal, which is maybe an improvement over Starlight Twinkle, the last front runner?). At any rate, she doesn’t have a bed or a car seat or a changing pad or diapers, but a diaper bag is on its way, and that feels like something. I cannot believe it's been almost a month since I've posted anything. 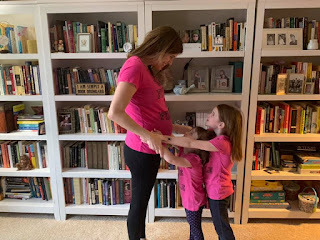 I realized recently that I have been incredibly lucky in that I was finished working at this point in my last two pregnancies. Having Zuzu at the end of June and Coco in August meant that I had summers off to lie around, do kick counts, and go to multiple doctor appointments per week as needed without having to schedule that around teaching, prepping, commuting, grading, or meetings. I'm also trying to prioritize activities like napping and going to bed early, which is hard. Last week I made myself stay up late two nights in a row to plow through grading. This is not unusual for me, as I'd rather get it out of the way, but it resulted in me being so exhausted and emotionally unstable the following days that I realized it is just not something I can manage at this point. So that means I need to be managing my time better and fitting all of it in during normal daylight hours because I just can't stretch it into late nights and continue to function very well. And that means that I haven't been blogging and a few folks have wondered what's up (and feared the worst). Let me say that things are still fine here. I'm in week 33 of this pregnancy, which means next week I'll hit 34 weeks 3 days (the day I lost Eliza) and my anxiety is feeling that anniversary. My keep-me-up-at-night worry has shifted from placental abruption (although that's still there) and is now mostly centered on cord accidents. Baby has been flipping from breech to head down and back. She's currently breech and I want her head down, but I also worry that all this somersaulting is going to knot the umbilical cord or wrap it around her neck/wrist/ankle and kill her. Another doctor I saw briefly in the Maternal Fetal Medical center looked at my history, asked a bunch of questions, and then suggested that I'd had preeclampsia with Eliza. I was aware had many of the symptoms (particularly the swelling) but my blood pressure always runs quite low. There was never an official diagnosis or determination of cause of death for Eliza. There's also nothing that can really be done to prevent preeclampsia, although a baby aspirin can apparently help (which I'm already taking). It's not exactly new information, but it has made me hyper aware of any ankle swelling and it has reminded me that I may need to slow down and take it easy, even when there are things I don't want to miss out on. So that's the pregnancy update. NSTs and modified biophysical profiles are going well. I had one NST that took a while for her to meet the heart rate accelerations they are looking for and it stressed me out a bit. I need to remember to bring a snack or a lemonade or something to those appointments. I definitely feel glad to be going twice a week; I'm scheduled for Mondays and Thursdays from now until delivery. The other good news is that as baby continues to get bigger, I'm feeling more movement (still all around the edges of the anterior placenta). I will take it! In other news, I went to KC last weekend to visit my best friend and see Rachel Cargle speak. If you're not following Rachel Cargle, you are missing a challenging and important voice in anti-racism work. She writes primarily to an audience of white women, encouraging us to unpack white feminism and look at the ways in which we are (purposely or cluelessly) complicit in perpetuating racism. She does this not because she feels compelled to do white women a favor, but because she is actively trying to make the world a safer place for people of color, particularly women of color. She has also created a fund to pay for black women to go to therapy, prioritizing the mental health of those for whom existing in the world is more of a struggle than white women can possibly realize. She was a powerful speaker and while I intellectually have read and learned many of the things she mentioned regarding the problematic history of white feminism, it was both motivating and humbling to hear the message again coming from a woman of color. I was in a terrible mood yesterday. My allergies have been so bad. My nose basically was so stuffed up that it sounded like I was talking and purposely plugging my nose, and my sinuses felt so much pressure it was like my face might just explode at any moment. Plus I started coughing on the stairs on my way to class and peed a tiny bit in my pants (thank goodness I was wearing black and it was only a tiny bit, but STILL not exactly making me feel like a competent professional as I head into a classroom to talk about Jane Austen). I took out some of my frustration on my Missouri House State Representative, Dean Plocher, who went ahead and voted to allow guns to be concealed and carried on college campuses in Missouri with no required training or regulation. I can't even tell you how opposed to this I am. I felt a little better after leaving him a voicemail, even though I probably sounded like a crank caller with my nose completed clogged with snot. I've been reading a parenting book I've found very helpful: How to Talk so Little Kids Will Listen by Joanna Faber & Julie King. It takes effort on my part to follow their advice, but it actually works very well. I have noticed, though, when I am tired/not feeling well/cranky that I DON'T want to follow their advice and I just want my kids to do what I say the first time I say it. Unfortunately, my children's behavior is in NO WAY influenced by the mood Mommy happens to be in or the fact that Mommy's sinuses feel potentially explosive, so I really need to work on making these habits more automatic. Still, I highly recommend the book, and lots of it is skimmable (like the stories from parents) so it's a fairly quick read, though I still have it because I'm actually going to write myself up a little reminder cheat-sheet and hang it in our pantry to reference when I find myself thisclose to screaming at the small people in my house to put on their mother-effing shoes. Here's some boring news: I'm really working on drinking lots and lots of water. I thought I'd been doing okay, but I was feeling so fatigued a few weeks ago and my doula asked me how much water I was drinking and I pretty quickly realized the answer was Not Enough. I used to have this app on my phone that was a little plant that reminded you to drink water, but I wasn't great at updating the app in real time and when the plant would wilt and look sad it made me feel really guilty (stupid cartoon plant) so I deleted it. But I do need a water tracker of some sort. My goal is to drink 80-100 ounces a day. This causes me to have to pee all the time (plus the aforementioned incident while coughing), but it does give me more energy and also keeps my amniotic fluid levels where they need to be, so lose/win/win. 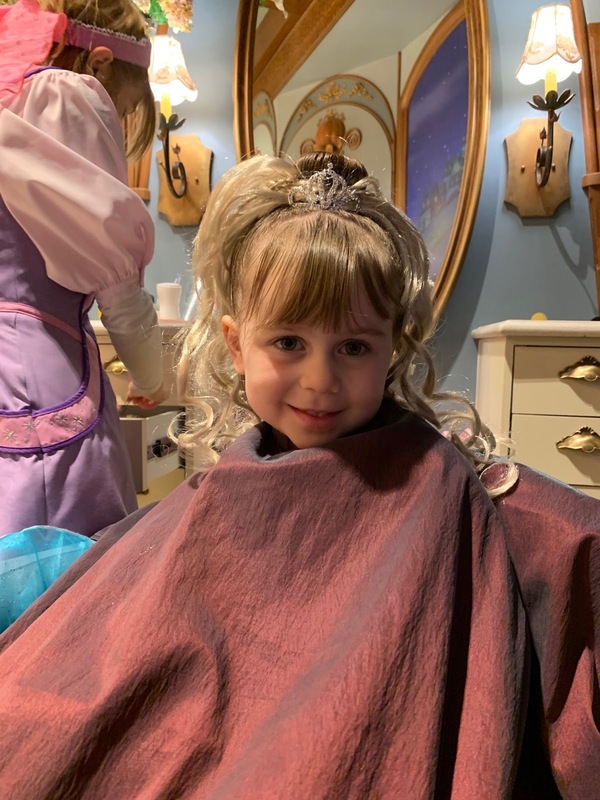 Zuzu had some major girlfriend drama at school earlier this week when another girl in her class said her "Caroline Poopy-Pants Poops in her Pants." She told me all about it, VERY indignantly, and said, "AND IT ISN'T EVEN TRUE!" To make matters worse, another girl in the class laughed when her best friend said that. But Zuzu and her other friend didn't think it was funny! And Zuzu told the girl, "That really hurt my feelings!" She also reported it to the teacher. Anyway, Zuzu reported the next day that she had decided to forgive the insult and be friends again with that girl, so she seems to be navigating the treacherous world of first grade insults as well as can be expected. Zuzu: When we cut down trees, it hurts the earth. But we need paper so we can draw. So, it helps us. But it hurts the earth! Me: Well, good paper companies will plant a new tree for every tree they cut down so the earth isn't hurt too bad. Coco: (very somberly) One time, Sadie ate sand from the sandbox. This morning, Zuzu asked me if I knew the most dangerous animal in the world. I guessed hippo, but she told me it's a fly because they carry diseases that kill 226 people a year. Is that true? It's so gross. And now I have officially reached the stage where my kid knows more than I do. I'm on spring break this week. I spent yesterday sorting through little girl clothes in the basement. I need to organize (and cull) dress up clothes and Coco is asking me to pull out Easter/spring decorations, so that's on the agenda for today. My anxiety levels are much lower than they were last time I posted. I've had no bleeding or any other troubling issues, and the baby has been quite active. I'm also glad to be at home where I can lie on my side and do a kick count any time I want to (I really need my university to get me a full length sofa for my office). I'm still eager to see my doctor and I'm definitely going to request that we start monitoring with nonstress tests earlier than we had originally discussed. Nothing like a hospital visit to amp up the urgency of that kind of thing! I was looking back at my New Years Resolutions and feeling a bit meh about them, considering that we're coming up on being a quarter of a way through the year! I haven't done nearly as much reading as I wanted to. I've read a few books, but I haven't made much headway on my Modern Mrs. Darcy reading challenge--mostly because reading books for class interferes. I did read a thriller for book club and I finally finished White Fragility by Robin DiAngelo, which was great. The best book I've read so far this year is The Warmth of Other Suns by Isabel Wilkerson. I'm still not quite finished... probably 2/3 or 3/4 of the way through. I expect to finish it this week. It has been eye-opening. There is a section about migrants and studies that show the farther someone has to travel, the more motivated they are to work extremely hard at any job they can get in order to achieve success and economic/personal security (relative to their previous conditions) once they arrive. It made me think of the terrible things Trump has said about the people migrating to the United States from terrifying situations in Central America and how determined and frightened they must be, and how I wish they could be given a chance. But the book also talks about the anti-migrant sentiment that has always existed--a fear of scarcity and economic anxiety that prevents us from being welcoming to newcomers. We just see these same patterns over and over again and it seems that we don't learn anything from them. Anyway, on top of all that it's remarkable stories and it's so well written. I'm already certain it will be one of my best reads all year. Maybe my biggest personal growth stretch goal on the list was to do more anti-racism work/learning, and I signed up for a 12-week workshop that started in January. We just completed week seven, and I'm relieved to say that it's been a really good experience. It was not an easy start--leaving my cozy house just when we'd be getting settled in for the evening, driving across town in the cold and the dark to sit in a school with a bunch of strangers and talk awkwardly about whiteness and anti-racism... but I'm glad I stuck it out! The numbers have dropped off slightly, but that means I feel like I'm getting to know (and like!) the people who are there and it's definitely introducing me to people outside my normal circles of colleagues-from-work and moms-from-school. Plus, thanks to daylight saving time, it was light out when I drove there last night! My biggest goal flop has been yoga. I found that I couldn't keep up with Adriene's 30 day challenges in my second trimester and the prenatal yoga videos were too boring (and like 40 minutes long! and you do nothing!). Don't get me wrong--I found a few that are okay, but not enough variety to keep it interesting. Plus, the usual excuses: busy, exhausted. After my scare last week and everyone telling me to take it easy, I almost felt like I shouldn't move at all! I need to get back into at least some gentle stretching, so that's something I'll do this afternoon (after I finish sorting dress up clothes and washing the few outfits that smell mysteriously like pee...). It's never interesting to hear someone talk about being tired, but I have been trying to remember if I was always this tired in the third trimester. I am not someone who generally takes naps, but I could seriously take a nap almost every day. And I'm getting 8 hours of sleep a night! Maybe this is why they call it a geriatric pregnancy when you're over 35? Because I could nod off and sleep at any given moment, much like my octogenarian Papa? I do think that some consistent sunshine and warmer temperatures would make a huge difference in my energy levels. I did discover a huge bag of newborn and 0-3 month clothes in the basement and I had no idea where it came from. It turns out that a mom at David's school passed them along to us, and he hid them in the basement because he knew I wouldn't want them yet! I did sort through the bag and fold everything into a storage bin. I am so appreciative, and I need to write the mom a note! I just am not quite ready to wash and fold and put things in dresser drawers. I also need to figure out where baby's clothes are going to go... our master bedroom is absurdly large, so we're going to keep baby in there in a bassinet for the first several months (which is also what we did with the girls). But I will need to rearrange dressers. I may put baby clothes in the guest room, which also means moving things around in that closet... I don't want to lose the guest room, so I would imagine we'll move Coco into Zuzu's room and give the baby her own room, which isn't a big deal since they sleep together almost every night anyway. But they have way too many clothes, so that's the part I will need to figure out! Thank you so much for your kind words and good thoughts and good vibes following my last post. I'm at 29 weeks now and while the end does not yet feel like it is in sight, I know that we are getting close. "A Rainbow Does Not Negate the Ravages of the Storm"
Warning: This one is scary. My new doula sent me that quotation last night. She had heard it on NPR, I think, and it made her think of me. The ravages of the storm got to me last night when I had an unexpected complication with this pregnancy. First, let me remind you that so far everything has been normal skewed toward good. My numbers were strong from the start. My genetic testing came back with no additional risks detected at 11 weeks. My anatomy scan looked good at 20 weeks. My glucose test came back normal at 25 weeks. On Monday, I hit 28 weeks--the official start of the third trimester. Last night (Tuesday night) I was finishing up a normal day. David was late because of interviews and I had just put the girls to bed when he got home. I lay with them for a little while, idly scrolling through my phone, and then decided to go take a shower and lie down in my bed to do a kick count. The one hiccup with with this pregnancy has been that my anterior placenta has made movement really hard to feel. It's driving me bonkers, honestly. Kick counts take much longer than they ever did with Zuzu or Coco, and she tends to be most active just before bedtime (9-10pm). I usually have to be lying on my side to really feel movement, and I can basically tell the size and shape and location of the placenta because I mostly feel her around the periphery. I was feeling okay last night, mostly because I'd had a doctor appointment yesterday morning. My regular (beloved) OB is out of the country on a vacation in India, so I saw his nurse practitioner. I was a little anxious about this (unlike other patients, I don't rotate through every doctor in the practice. I only see Dr. W. I am very much a Special Needs Patient in this regard.) But anyway, I'd rather see someone random than miss an appointment, and I couldn't really ask Dr. Wasserman to schedule his international vacations around my doctor appointments (I mean, I wanted to but some part of me remains rational). As it turns out, the nurse practitioner was great. She was familiar with my history even though I'd only seen her one time before--during my pregnancy with Eliza. She was kind and reassuring and answered all my questions and validated my anxiety and made me feel better. I've been fixated on a worry about placental abruption. I've recently met a baby loss mama who lost her baby to a sudden placental abruption with no known cause at 36 weeks, and that's probably why it's at the forefront of my mind. But I also think the anterior placenta has made me more anxious--if I bump into something, or one of my kids uses my stomach to push off of and launch themselves off the couch, I get freaked out that I've just broken my placenta. Anyway, she told me that there is no evidence that the position of the placenta has any bearing on the likelihood of an abruption, which I found comforting. I yelled (quietly because the girls were sleeping) for David and told him we needed to go to the hospital. David called a neighbor to come stay at the house with the girls (who were asleep and had no idea we we even left). We drove to the hospital. It took maybe 15 minutes and I didn't feel any movement the entire time. I sobbed my story to the nurse at the desk and she took me back immediately and starting asking for my information and trying to take my blood pressure and pulse. I was shaking uncontrollably at this point and could hardly catch my breath. I kept saying, "Oh my God. What if there's no heartbeat?" She wanted to see how much I was bleeding and she FINALLY (it really was only a few minutes but it felt like forever) took me back and hooked up the Doppler monitor. I was still shaking so hard it took a second before the machine could pick anything up, but then the baby's heartbeat blipped on the screen and I was able to calm down enough that they got a good read on it. It was totally normal. Which of course made me start crying all over again. By this time the bleeding had already let up a lot. Another nurse came in and asked me a bunch of the same questions, and then a nurse practitioner came in. Everyone was very kind. I was totally wrecked--my hair was still soaking wet from the shower, I was crying off and on. But I got an ultrasound (baby looked perfect), a cervical exam (totally closed), and the baby was monitored for about two and a half hours (no decels, heart rate normal). I finally started to relax after the ultrasound when they put the Doppler back on. I had stopped bleeding by then and I could just listen to the galloping rhythm of the baby's heartbeat as I lay on my side and sipped cranberry juice. The nurse practitioner did a swab when she did my cervical exam and she determined that there was a pH imbalance. This minor infection can apparently irritate the cervix and cause a blood vessel to break or rupture. It is unusual, but slightly more likely to happen when taking blood thinners like a daily baby aspirin. That seems to be what happened to me, as there was no other source of bleeding they could find and the bleed had totally resolved within an hour. They let us go home around midnight, with lots of reassurances and invitations to come back anytime I feel worried or concerned. Once I got home, I collapsed into that exhausted but jittery kind of sleep and then had one of my recurring nightmares about driving a car off the edge of a cliff because my psyche likes to work through SUPER OBVIOUS METAPHORS when I am stressed out. Today I'm not having any bleeding (checking obsessively) and I have a prescription to fix my imbalanced pH situation. I'm feeling some movement as I sit on the exercise ball at my desk and I have an appointment to see my doctor as soon as he's back in town (not soon enough, but I'll take it). I still feel so shaky and vulnerable, though. As we drove to the hospital, the night that we went in unexpectedly early with Eliza because I was having contractions was vivid in my mind. The major difference wasn't fear--I was scared both times. But with Eliza, I thought it was going to be okay. I thought they were going to fix it. I went in innocently assuming that whatever was wrong could be made okay again and maybe I was looking at a c-section and a premie. This time I went in knowing what it felt like to get the very worst news. This time an emergency c-section and a super early premie felt like my best option, and I didn't think it was possible. I expected them to say there was no heartbeat because I'd heard those words before. I was not a naive mom, pregnant for the first time and confident the doctors could fix anything. I was feeling every bit of that previous trauma. Having had two successful pregnancies since then did nothing to negate the ravages of my grief. I know too well that there is nothing to prevent that tragedy from revisiting me. Statistics don't keep me safe. Lightening could strike again just as it did in the first storm of grief. We could go home from the hospital empty handed. I really didn't need that brutal reminder--I'm already well aware that the odds being in my favor is no guarantee. But I'm so grateful that this time we got a different answer. This time, that teensy little four chamber heart was beating away in there. This time we get to hold onto hope. I texted my doula an update on everything and she responded and then sent me the quote about rainbows and storms. It was exactly right. Even coming out safely twice doesn't make me feel like the storm never happened. It just makes me feel like somehow I got away with something, and I'll have to get really lucky (and be really vigilant) if that's going to happen again. Now if you're looking for me, I'll be spending virtually all my free time between now and the end of May lying on my left side doing kick counts. I've started listening to a podcast by Laura Tremaine called "10 Things I Want to Tell You." The most recent episode was about teachers who made a significant difference in your life--good or bad. The premise is that she sort of starts the conversation and then you should share your own Things to Tell in a journal or with friends or on social media. So here goes! My first grade teacher scared me. I wanted her to like me, and I think she did like me (I was a good student!) but she was intimidating. Now that I look back, I think that she probably wasn't a great fit for first grade, personality-wise. She was never mean to me, but I definitely was scared of her after watching other kids get in trouble. There was a little boy in my class who got paddled nearly every day. Yes--capital punishment, wooden paddle, hit by the teacher in the hallway. Almost every day. (I reminisced about at my high school reunion this with another guy who was in my first grade class and we were both traumatized by being witnesses to this.) This kid got in trouble all the time for acting up. I'm sure now he would be diagnosed with something and given support and special services and counseling, but in the late '80s, he just got the crap beat out of him on the daily. I actually peed my pants in her class one day because I was too scared to ask her if I could go to the bathroom because she got really mad when kids asked to go to the bathroom on their own instead of when we all went as a group. She saw the puddle near her desk and yelled and asked who did it and she MUST have known it was me? I mean, I was back at my desk this time and I tried to put on a wide-eyed innocent face, but I had to be the only one who smelled like fresh pee. I had on a dress, but my shoes were soaked in urine. I think it was the end of the day, though. She must have known it was me, but she never called me out on it, I remember my dad picked up that day because I ran up to him and hugged him and I didn't want to let go because I didn't want him to see my pee shoes. I wonder if he talked to the teacher about it? Because I do remember him telling me it was okay to ask her if I needed to go. Anyway, she ended up switching from first grade to fourth grade and that was probably a good move for everyone (though hopefully that poor kid who got paddled every day didn't get assigned to her classroom again). My second grade teacher was the opposite. Mrs. Brandt was so kind and smelled really good and was very huggable. She would tell stories about her boys and it made me want to grow up and have a bunch of boys (LOL not so much now). I got to take home our class pet, a small turtle named Tiny Tim who was a good sport and never gave me salmonella. Once I got to school earlier and went to the classroom instead of the cafeteria because I never got to school early so I didn't know we were supposed to go to the cafeteria. Anyway, Mrs. Brandt let me stay in the room and help her set up, which I loved. I remember watching her use Lysol spray all over the desk and cubby of a little boy in my class and wondering why it was just his desk that got treated. I assumed maybe it was because he smelled strongly of wood smoke. I can't remember what she said to me about it, but I remember her basically telling me not to mention to any of my classmates that she did that. My third grade teacher was also wonderful. I had Miss Tinsley maybe her second or third year of teaching? She was young and cute and she told me that I reminded her of Ramona Quimby, which I took as an enormous compliment. I felt comfortable enough in her class that I got a little chatty with my friend Mandy and sometimes we'd have to put our names on the board, which we sort of relished even though it was supposed to be a reprimand (if you got two checkmarks next to your name there were consequences, but I don't remember what they were because I would behave myself after that). Miss Tinsley also encouraged my reading. And she let us vote on the slogan for our class bulletin board when we made butterflies by tracing the outlines of our feet. The top two slogans were mine and this kid name Kevin. Kevin's slogan was "From Feet to Butterflies." (Kevin was apparently a literal kind of guy. He spiked his hair (or his mom did?) with a lot of gel and I thought he was very cute but I thought his slogan was super lame.) My slogan was "Butter Up Your Wings for Spring!" and my slogan won and I was very proud and I thought that Miss Tinsley was proud too because she always made me feel like she was rooting for me. My fourth grade teacher was also lovely. Her name was Mrs. Copeland and she read aloud to us every day (James and the Giant Peach was particularly memorable). She also wore visible eye shadow, which I thought was very glamorous. One day, though, she hurt my feelings SO much. She wasn't even there--we had a substitute--and she had left a note for the sub with lesson plans and also listing students who were good helpers. I must have been up near her desk talking to the sub or just nosing around (who knows?!) but I could easily read her perfect penmanship and she had written, "Amie, Mandy, and Leslie are all good helpers." I could not believe my name was not on that list. Like I wanted to put my head on my desk and cry. I didn't do that, but my heart was broken a little bit. After that year, Mrs. Copeland quit teaching and opened a little gift shop on the square and in middle school I'd often walk down there and buy cinnamon gummy bears from her, so there were no hard feelings. I think she quit teaching because our class was challenging. There was one kid who wrote sentences for his spelling words and put the word "fart" in every sentence. The laughter was riotous and I'm sure he got sent to the office, but I will always remember how awed I was by his nerve and how funny it was to hear him read a sentence about a fart out loud. After fourth grade we went to middle school. I had some great and memorable teachers, but we switched classes so it was a different relationship only seeing them for an hour or so per subject. My favorite teacher was Mrs. Snyder, my fifth grade reading teacher. She told me once that if you cut my veins, words would come out. And I took that as another huge compliment. I read like crazy in her class. I could get all my work done and she'd let me sit and read whatever I wanted. My friend Monica likes to remind me of the time I basically read the entirety of Wait Till Helen Comes during our class period. I did love Mary Downing Hahn. Fifth grade was when I really decided I wanted to be a writer, and Mrs. Snyder totally encouraged that. I can't list my best and most impactful teachers without talking about the other Mrs. Copeland, who was even more influential--in part because she taught me from second grade through sixth grade. She was the gifted teacher and we'd go to her "Action Class" one day a week. Mrs. Copeland put up with and encouraged all of our quirks and weird interests. She is honestly the teacher that I probably would want to emulate the most with my own classroom persona as a professor. She was always kind, but she did not put up with nonsense. She was always encouraging and patient, but we knew we were being held to high standards. She was not exactly warm and fuzzy, but she made us feel loved and made us want to impress her, too. I often felt like I wasn't as smart or talented as my classmates with their ACT-word vocabularies or super quick math-minds. But she encouraged my creative writing and my love of logic puzzles ("mind-benders" we called them) and I always felt seen, known, understood, and appreciated in her classroom. I had some memorable college professors. There was the huge, bearded history professor who taught a class about the Holocaust and sobbed on the day we discussed Holocaust deniers. There was the uber crunchy environmental science professor who drove me to the hospital the day I sprained my ankle on the way to her class (first I had to sit through her lecture with my foot iced and elevated--but she did send one of my classmates to get the ice for me). But it was a young English professor, Dr. Kelemen, who really served as my mentor and made me believe I had to chops to do graduate school or law school. I'm actually embarrassed when I think about my behavior in his Shakespeare class... I should have been a better student and talked more... I now appreciate student participation so much! I didn't do a good job of it as a student myself. Dr. Kelemen really talked to me like an adult and a peer. I remember going to get coffee with him and his wife to talk about my GRE scores and my options and feeling that I wanted to be just like the both of them. He gave me such great feedback on my writing--stuff that I still think about today. He invited the English majors to a holiday party that he and his wife hosted with friends and professors and someone was handing out stickers that said "Martin Sheen is my president" and I was like "These people are amazing. How do I hang out with people like this all the time?" Years later, when David and I were in London, Dr. Kelemen happened to be there at the same time. We met up with him a couple of his friends and went out to dinner and it was so intimidating and so cool. He has since left academia, but I am so grateful that I got to be his student. I do not have a stellar academic career--I don't say that out of false modesty--it's just true. I haven't focused on academic publishing or anything like that. But I do love teaching college students and I'm not terrible at it. And I can truly say that there is no way I would be here in this job if it weren't for him! So those were my most memorable teachers... the ones who really made a difference in my life. I'm so grateful for them, and I'm grateful that Zuzu's first grade teacher is wonderful--so much so that Zuzu is convinced I know nothing and Ms. Williams knows everything and I don't even really mind. We have been at my parents' for the weekend. The drive down on Friday was not fun--we weren't able to leave St. Louis until 6pm (getting home from work, packing, feeding kids, etc.--it takes so much time!) and then it was raining on and off and so foggy the entire time that I was tense (even though I was the passenger) and at one point I finally started drifting off to sleep only to do that startle-awake thing MULTIPLE times. So I just woke myself up. But anyway, we arrived and have had a really nice visit. We made a Walmart run so the kids could spend the money they got from their other grandma in their Valentine cards. They bought these awful LOL dolls that they think are so awesome and which should really be regulated when it comes to the excessive and wasteful packaging. Part of the "fun" of the toy is that it's a surprise so you don't know what you're getting and you open each little accessory separately but it's all a bunch of plastic and garbage and I hate it. My mom also let the girls choose their own t-shirts to match these little rainbow skirts she got them and each one picked the most hideous options in their size range, instead of the relatively cute option I wanted them to get. BUT I ran into my high school boyfriend's sister and grandma and I got to talk briefly with them and see his sister's new baby and that was really fun. I STILL miss that family and how welcome they made me feel. We also saw my cousin and her little girl as we were in the check out line, which was fun even though we already had plans to go visit them and see their new house after lunch. 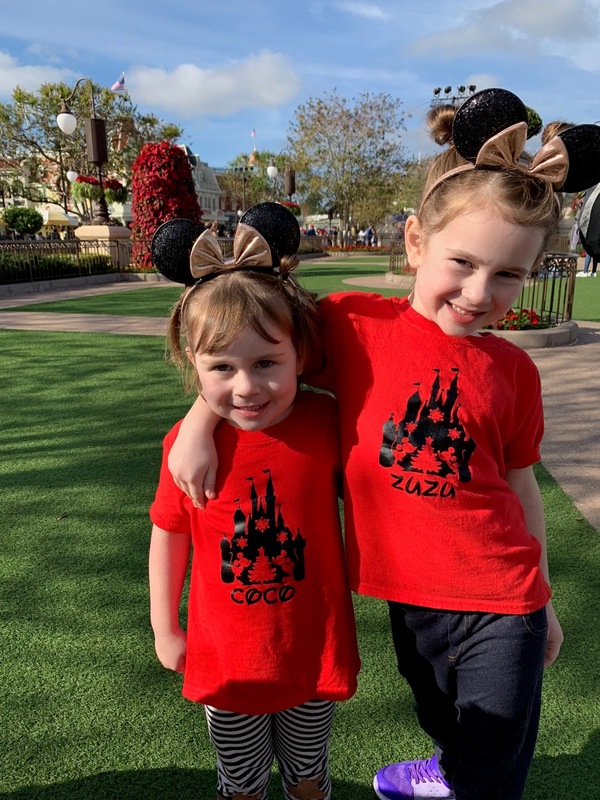 It was like a bonus visit, and Mesa and Zuzu were delighted to discover they were wearing the exact same style of boots! I managed a nap on Saturday afternoon (sort of--I felt sure I was always aware of the NOISE happening around me, but I did feel a little bit rested after). So we visited Brandi and Mesa and then we came back and my mom fixed dinner and my Papa came in town and ate with us and the girls were reasonably well behaved until my dad got them totally riled up and crazy but they settled down with a bath and some books and went to sleep pretty quickly (although it was probably 45 minutes past their usual bedtime). Today I was really looking forward to a breakfast date with David. We like to send the girls to church with my parents and then go out for a big breakfast at the White Grill. Coco was whiny and mopey this morning and I knew it wasn't normal behavior, but I was chalking it up to still having the sniffles (they dragged on all last week) and being overtired. I should have been clued in when she didn't eat much breakfast and wanted to snuggle with me before they left for church. Instead, I was thinking about scrambled eggs and hashbrowns and I sent them on their merry way. Maybe ten minutes later, I was in the shower when David knocked on the bathroom door to tell me Coco had thrown up and he was on his way to go pick her up. Let's all just hope we can make the drive home without her barfing in the car. We drive a Honda CRV and I love this car. I had a different Honda CRV before this one and after driving it for ten years and 150,000 miles, we just upgraded to a new version of the same thing. I loathe new car shopping more than anything because I find it so stressful, so David actually bought it without me one day when I was home sick and I was thrilled. But when we loaded up to go out of town just for the weekend with two kids (both still in five point harness car seats) and two dogs (one on the seat in the middle, one on the floorboard) and a cargo area full of suitcases and dog food and pillows... I'm really not sure how we'll LITERALLY fit another human person in the car, even a tiny one, especially since babies tend to bring a LOT of accessories when they travel (little divas). We've researched car seats that will fit three across in a CRV (there aren't that many) and we plan to start with purchasing those (we'll be due for new ones anyway, thanks to six year expiration dates) but I'm just wondering if we'll need a bigger vehicle. I'm under no illusions that I'm too cool for a mini-van (I'm not at all cool) but I also appreciate the gas mileage my little Honda gets. The Pilot is obviously appealing because it's the slightly bigger version of what I already have and I am a creature of habit, but then I wonder if the garage will start to feel really tight because the Pilot just looks so much WIDER to me. And of course we will be making NO decisions on this until summer because apparently I am actually very superstitious and will not be tempting fate. For example, I went to the mall on Friday (which I NEVER do, but I confess that I always enjoy it because malls are beautiful and clean and they smell good and they remind me of a time in my life when I was young and fancy free and my parents paid my bills and I DID go to the mall). Anyway, I was returning a pair of pants I'd ordered online that I thought would work for loungy maternity pants but didn't because they aren't actually maternity pants. I have been really resisting buying maternity clothes since I know I'll never ever wear them again. I got lots of things on load from my SIL and I have a few loose-fitting tops that I can make work, so I committed to only buying maternity clothes second hand if I was going to purchase anything. BUT pants are hard, folks. First of all, I don't think many people sell or donate loungy maternity pants, probably because we just keep wearing them postpartum. Secondly, I have some jeans that I'd loaned to Jo and she gave back to me, but that's five pregnancies between the two of us and I remembered that I'd literally busted through the seams on the belly panel on one pair and she'd sewn them back together. Anyway, long story short, I returned the non-maternity pants that were a pipe dream and then went to the maternity store and managed to find a pair of jeans and a pair of lounge pants on the clearance rack and only spent $10 more on the both of them than I had originally spent on the non-maternity pants. So I was feeling pretty good about all of this, but you know what maternity clothing stores do when you check out? They ask you for ALL OF YOUR INFORMATION--address, e-mail, due date--so that they can put you on their mailing lists and send you ALL THE COUPONS and ALL THE ADVERTISEMENTS for ALL THINGS BABY AND PREGNANCY RELATED for basically ever No. Thank. You. Pass. So when she asked for my e-mail address, I lied. I briefly considered explaining the whole story, but instead I gave her an old e-mail that I haven't really used since college and walked away feeling relieved and wondering if I also should have provided an old mailing address because you KNOW they are going to snail mail me ads too. I've been fooled by that game once before, and I'll never forget that sick feeling in the pit of my stomach as I clicked and e-mailed and sometimes had to make phone calls to try to unsubscribe from all of the things congratulating me on my January baby who was born weeks early and never came home. Keep your effing coupons and all your assumptions of a happy outcome. These companies have no idea how much pain they can cause with a freaking e-mail listserv. In other pregnancy updates, I passed the one hour glucose test on Friday. There was some mild drama at the lab (and by "drama," I mean people talking to me in a rude and/or condescending manner) because I chose to drink the drink at home (as my doctor suggested) rather than parking myself in their waiting room for an hour. They were less excited about this approach and seemed really annoyed that I didn't know the exact number of milligrams in the drink my doctor had given me (ummm... it was the standard size for the one hour test! And HE gave it to me, so he will know!) but it was over and done with fairly quickly. Blood draws. So gross. Tomorrow is the last Monday in February, which feels like something worth celebrating as well. I shifted my loyalties from fall to spring over the past several years, and I am more than ready for warm sunshine and sunlit evenings. My big plans for spring break mostly involve reorganizing my house, donating half the stuff in the basement, sorting through the girls' clothes and sorting through my clothes, too. Two more weeks until I get started on that project! And then we'll have just six more weeks left of the semester. One final thought for today... scrunchies. I'm a child of the 80s/90s, so of course I'm a fan of scrunchies. I ordered a set from Amazon and I have zero regrets. Zuzu also thinks they are awesome, which I find hilarious. Now if I start talking about revisiting baby doll dresses and Doc Martins, I may need an intervention. But I'm feeling just fine about this scrunchy habit. I know Valentine's Day is a commercial holiday just intent on selling chocolate and flowers and chocolate-covered strawberries and pieces of folded cardstock that cost more than a Starbucks latte and say someone else's words on them, but I still kind of love a day about love. Today my English department hosted a "Love and Anti-Love Poetry Reading" and invited students to share a poem (their own writing or someone else's). We had a good turnout (you just never know with these things!) and several great poems shared. I heard "When a Boy Tells You He Loves You," by Edwin Bodney, which was new to me, and my old favorite "Tonight I Can Write..." by Pablo Neruda. One of my colleagues read "Having a Coke With You" by Frank O'Hara, which is so charming. I love a breathless, run-on poem. Sending love into the universe... and now I'm wanting both a latte AND a chocolate covered strawberry. If you're in the mood for some more love poems, here's a few writers with their favorites. She is much perkier today, and is determined to make the most of her day at home by binging cartoons and drinking juice--both major treats. I'm trying to do All The Things for work and domestic life, which has me answering e-mail and setting up online quizzes, adjusting due dates, grading exams, and making lesson plans in between doing load after load of laundry, throwing together stuffed shells in the crock pot, making macaroni & cheese for the sickie, and I've just about convinced myself to make oatmeal chocolate chip cookies for The Closer. My big excursion today was a walk to the mailbox with Clementine, which just reinforced how miserable this weather and how much I need some exercise. Maybe I can convince myself to spend 10 minutes on the elliptical this afternoon? We'll see if she actually takes a nap today... She seems pretty well rested at the moment. Unrelated to the flu, I have been going to a weekly anti-racism workshop (getting further involved in social justice movements in St. Louis was a new year's resolution, and this is one step in that direction). One of the things we did was write a personal narrative getting at why we care about issues of racism and social justice. It was an illuminating exercise. I realized that Eliza's death was a profound turning point in my life, not just because of the devastating grief, but also because it burst the illusion I had been comfortably living with: the idea that life is mostly a meritocracy. I mean, I knew that bad things happened to good people, but I really was invested in the notion that we can control most of what happens to us, as long as we work hard and try to be kind and, you know, have grit and determination and all that stuff. When Eliza died, the rug was ripped out from under me, and I had a new understanding (belated, clearly, since I had spent all my life living a pretty privileged and sheltered existence) of all the circumstances outside my control. I've now come to believe that, because the universe can throw a curve ball at any moment, because there are no promises about life being fair or just, it is crucial that we make sure the systems and institutions that we can control are as fair and equitable as possible. So that has become something I'm really passionate about--particularly since in a city like mine, it's painfully obvious how unfair and inequitable things like education and housing can be. One of the first things we did at the workshop was go around and introduce ourselves and say "who your people are." Relieved that I didn't have to go first, I listened and thought as we went around the circle. You know who my people are? I said, "Readers, writers, academics, parents of young kids, and especially bereaved parents." It felt really good to say that out loud. It made me think of the days I longed for an arm band to indicate that I was grieving--some kind of outward sign that said, "My baby died and I'm barely coping. Please be gentle with me." I don't feel that raw and vulnerable so much these days, but I still sometimes feel set apart from the non-bereaved parents--especially the idea of them as a group (like PTO moms). It really is a sorority nobody wants to pledge, but it's filled with some of the best people I know. And I just feel like life is easier if people know from the moment they meet me that bereaved parents are my people. This month of February is so bleak. 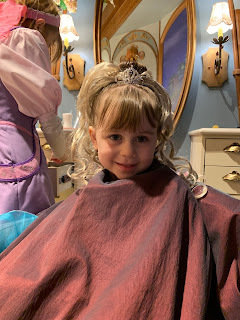 While last week was overly busy, this week is much less chaotic, especially since Coco will likely be sitting out of her Spanish and dance extracurriculars. I'm trying to appreciate the coziness of being home--lighting candles, doing yoga, listening to Brandi Carlisle nonstop. And speaking of hygge, I'm off to make those cookies. Wash your hands and eat some cookies and let's have spring hurry up and get here. Tomorrow marks 25 weeks in this pregnancy, which feels really hard to believe. So close, and yet so far away! A week ago, I had a teary meltdown worrying about the baby. 24 weeks is technically viability (although the odds are not great) and immediately my anxiety goes up. Viability means I need to pay attention, I need to know what's going on, I need to be intuitive and psychic and medically trained to figure out what could be happening and how to make sure the baby is going to be okay. No pressure. I'm not sure if I've mentioned that we found a doula to work with again this time. I had hoped to work with the amazing woman who somehow transformed Coco's birth into a wonderful experience for me, but she's retired from the doula work, so she recommended another doula in the area who also seems great. One awesome thing about doulas is that they are more interested in pregnancies than in children--that's the medical history and physical/emotional experiences they want to know about, right? So every conversation with her includes Eliza, she says Eliza's name all the time, she constantly talks about my "fourth baby" (which OMG four babies). So that's all really validating. As some of you may remember, part of the reason I work with a doula is because I want to avoid needles. I don't want an epidural because the idea of a needle in my spine is scarier to me than the idea of experiencing pain for a few hours. And I am not judging anyone who gets an epidural (seriously in my circle of friends, I don't even know if one other person has delivered a baby without an epidural). It's just a control issue for me, plus now I've done it three times so it's what I know. But I also feel like I don't quite fit in to circles of crunchy moms who are all about non-medicated births and breastfeeding (even though I do those things) because I want all the monitoring--all the non-stress tests leading up to a scheduled induction. For Zuzu and Coco, I was induced with a Cervidil insert that softens the cervix. Both times, that was enough to get my body going into labor on its own so I was able to avoid pitocin and an IV--I'm hoping we can follow that pattern again this time. This is assuming I don't go into labor on my own earlier, because my anxiety will not allow me to go past my due date and I expect to be induced in week 39 as I was with Zuzu and Coco. So I'm planning to be induced, but also not to have an epidural. Natural birth advocates recommend intermittent monitoring during labor to avoid interventions that may actually be unnecessary. But I want constant monitoring. One thing that keeps me calm during labor is being able to look at the monitor and see the baby's heartbeat. I need to know that the baby is alive. So basically, I veer away from the totally crunchy approach AND I want to avoid needles, which puts me in a weird category. Fortunately, a doula is pretty much paid to support you and your birth plan, and to help be your advocate. My doctor is the same doctor I've had for all the girls. He knows my quirks and is supportive of my plans (hopes) for this birth, so I'm not too worried about pushback or anything like that. But I do need the support and reassurance of the doula to get me through labor! David does a good job, but he also appreciates the guidance of someone else who reassures us that everything is going well. Anyway, we met with the doula and talked through everything. She encouraged me to write up a birth plan. I always put "Goal: LIVING BABY" at the top because really everything else is just details, but if I can have the best experience possible for me and the babe (which would basically be a reenactment of Coco's birth, where I felt so amazing immediately afterward), that would obviously be ideal. If all goes more or less according to plan/history, I have fourteen weeks before the baby gets here. I'll start official kick counts a week from tomorrow. I see my doctor again in three weeks, and then I'll start seeing him every two weeks, and in late March (after spring break) I'll start biweekly non-stress tests. In some ways, fourteen weeks sounds like no time at all. In other ways, fourteen weeks is an eternity. It's an entire semester! It's more than three months. It's so many days, so many kicks, so many opportunities for infection, cord accident, placental abruption, all the unpredictable things I fear based on the heartbreaking stories I've heard. And all things over which I have very little control. 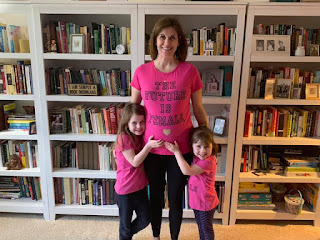 Another baby is a logistical and financial complication, a big shift for our family, a huge change I can hardly predict, and one that makes me a nervous in some ways. But this baby also feels like an incredible gift--like maybe it's too good to be true. I worry that we are asking too much, getting too greedy. We've been given two perfect little girls--how can I expect to get another one? Is this too good too be true? Is there enough luck in the universe for this to work out for me? *Zuzu wrote a story at school about her "bise weekend" and it took me a day to figure out that bise = busy. Why was she so busy? Two birthday parties to attend on Sunday! She's living the good life, folks. Here's what I've been doing: David went to a conference last week. He was gone Tuesday through Saturday, which is an absurdly long time for a conference. He said that it was productive and informative, so I'm glad it wasn't a waste of time, but managing our daily routine is definitely a two-person job, and we all really missed him. I was prepared to deal with the all of the things I expected--Coco getting teary at bedtime (she slept with his photo every night), dinners needing to be quick and easy to clean up, and getting up extra early to make sure I had time to deal with the dogs and packing lunches. I was not prepared for the polar vortex! A huge part of the reason we moved was to get David and Zuzu in the same school district so that they'd always be on the same schedule. Normally, anytime there is a cancellation for snow, my university makes the same choice as their school district. But when schools were canceling for low temperatures (due to bus riders), my university was still open. So I had to bring Zuzu to work with me two days in a row! Thankfully, Coco's preschool was still open, but Zuzu spent a lot of time watching a screen while I was teaching on Tuesday and Wednesday. It all worked out, but it was a little stressful and draining to not have any quiet time to think/read/prep for class except for after they were in bed! The week did have several bright spots though--I didn't get to watch any TV (I didn't sit on the couch and snuggle the dogs at all) but I did manage to cross all the things off my to-do list, which felt really good. We skipped Spanish Tuesday night because it was dark and snowing and freezing cold and I just wasn't up to getting out in it. We did go to dance, and had a very successful lesson. A few weeks ago, Zuzu had a wretched time at dance. She'd been sick over the weekend, but I really don't think that was the reason. I can't begin to fathom the workings of her mind, honestly. She has loved dance and asked this year to do jazz in addition to tap and ballet, but suddenly she was complaining every week about having to go. And then there was the day that she went, but refused to participate. After class, the teacher let me know that Zuzu had spent the entire hour lying on the floor. I was so mad, and I admit that it was because I found her behavior embarrassing. I also couldn't relate to it--I would have never done such a thing as a kid. I might have acted out at home, complained about class, or whined about going, sure. But I definitely would not have defied my dance teacher or flopped on the floor while my classmates all followed directions. I felt like she was being disrespectful and I was so mad. Out in the parking lot, Coco asked me what was wrong. I answered matter-of-factly, "Zuzu lay on the floor instead of dancing and I'm upset about it." Well, Zuzu was furious with me for sharing that information: "IT'S NOT BETWEEN YOU AND COCO!" I think she was just looking for a fight, because her rage culminated in her screaming, "I HATE YOU!" at me as she got in the car. In a parking lot full of moms loading well-behaved ballet dancers into mini-vans. Which is great, because if your first grader is going to lose her mind and scream that she hates you, you definitely want an audience of other parents. I'm not going to lie--it was humiliating. I was taking deep breaths and not responding to her at all. After her outburst, another mom called to me, "You're doing a great job, Mama!" which was really nice and actually made me get teary-eyed. The next day, we had a long conversation about being respectful. 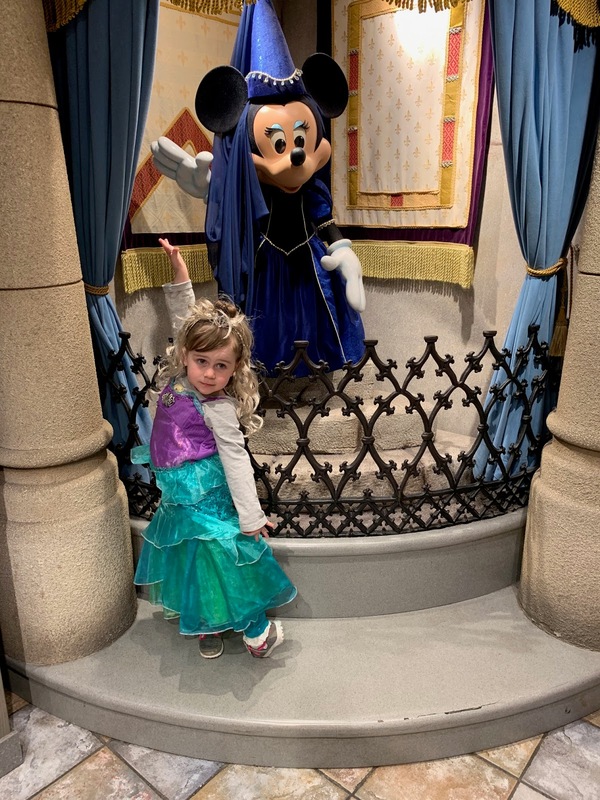 I'm not going to force her to take dance lessons if she doesn't want to, but I also don't want her to think she can quit by being an a$$hole. So we talked about why she takes dance lessons--to be active and healthy, to make friends, and to have fun. I told her that there are other ways to do that, and if she'd like to stop taking dance lessons when her swim lessons start in March, that's fine. But if she wants to take swim lessons, she needs to participate fully and respectfully in dance for the next few weeks. I've been bracing myself for dance lessons since then, but it's been fine. In fact, now she's decided she wants to stay in dance through the recital in June. (This child is baffling.) And while David was gone, she had a great dance lesson and the teacher actually pulled me aside (as I was pulling Zuzu out early to go home because driving in the snow makes me so anxious, particularly when I'm pregnant). Thursday night we had no where to go, and my parents came up on Friday which was so amazing because they picked up the girls from school AND my mom made dinner. It was like I was on vacation! David got home on Saturday and life is back to normal. This week is particularly busy, though. How does it happen that everything happens at once? I have a workshop tonight that runs from 6-8:30, and when you factor in the 20-minute drive there and back, it eats up my entire evening. It's a good workshop and my choice, but still a challenging time commitment. Tomorrow I'm volunteering to put up decorations for the school musical performance immediately after school; later that night the girls have Spanish and I have a We Stories meeting, so D and I are going to juggle drop off and pick up and still try to make and eat dinner together. Wednesday night is dance (fingers crossed it continues to go smoothly) and I'm on my own because David will be at his school all evening for an event. Thursday afternoon I have a doctor appointment to check in on The Closer (24 weeks today). Thursday night I'm double booked, but I'm choosing to attend Zuzu's musical performance (I mean, I can't miss her first one! Plus it's "The Day the Crayons Quit" and I think it's going to be soooo cute. And I get a reserved seat since I'm volunteering on Tuesday. #incentive). Friday I have to take Zuzu to a dentist appointment, and that night, she and David are attending a dance at school. (Confession: I'm so relieved not to have to go! I'm sure they will have fun and Coco and I will find something else fun to do that doesn't involve large numbers of elementary school girls shrieking in a gymnasium). Saturday, David and I have plans to go to dinner and the Fox. It will be great to have a date night, but I'm not fully looking forward to it because sitting through a show at the Fox the last two times we've gone has made my sciatic nerve flare up the next day. Any suggestions for avoiding that while sitting for two and a half hours in small, old, not super comfortable theater seats? I'll get up and walk at intermission, but that doesn't quite seem to be enough. I am considering trying a water exercise class on Saturday. Pro--I'm sure it would be really good for me. Con--I will feel social pressure to shave my legs before I go. Whew. So that's my week. Plus working--we're wrapping up Hamlet, The Taming of the Shrew and Pride and Prejudice in my three different classes this week, so my head is swimming with questions about Shakespeare, love, vengeance, Austen, gender roles, marriage, and how these questions transfer to our twenty-first century context. The big questions are so much fun. But it's so easy to get weighed down by the minutiae--and I fully admit that I am someone who gets a rush of accomplishment from crossing minutiae off a to-do list. Hoping to ride that rush through the packed calendar this week. 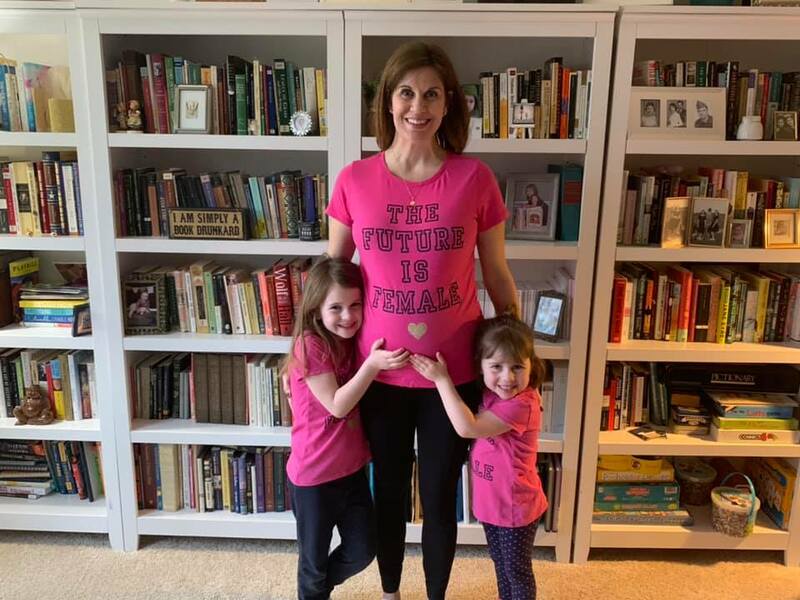 In case there was any question about it... the future is most definitely female. We are expecting Baby Girl #4! Do you know what is not interesting? Hearing about how tired someone is. Do you know why this blog has been silent when I feel like I have so much to say? At any rate, here we are, only halfway through week 1 of the semester and it feels to be like it should absolutely be Friday. Also: When the highlight of your week is a visit to the chiropractor (this afternoon at 3!) you know that you are old and lame. So I've mostly been doing work stuff, except last week I stayed home Thursday and Friday with a sick kiddo. I felt fine all day and then Thursday night I got sick. I felt okay Friday, but Zuzu's fever lingered on and off all day long, and then we got the big snows. She was fever-free on Saturday so she got to go play out in the snow Saturday and Sunday, but she wasn't quite her energetic self. Now she has a cold, so I think those germs got her while her immune system was down. Poor little punkin. Our big excitement this week was dog poop drama because that's just the life we live right now. I walked in the door yesterday with an hour to feed the girls and get them to Spanish class and the moment I opened the door I was hit with a wall of stink. Poor Clementine had diarrhea yesterday in her crate yesterday, which also got out of her crate onto the floor and all over her blankets and all over her. Meanwhile, and only slightly less disgusting, Cooper had been urged out of his usual Old Dog Stupor by the smell of peanutbutter in the kitchen trash can and all of the trash was all over the floor, including a peanutbutter container licked clean. I didn't have time to do the full clean up required (all the trash, plus bathing Clementine, washing the blanket, hosing out and scrubbing the dog crate, and cleaning the carpets) AND make dinner AND get the girls to Spanish. And there was no making dinner and going to Spanish without doing the clean up first (seriously--the smell hit me the moment I opened the door--we couldn't stay in the house without tackling clean up) and it was all SO DISGUSTING. Not to mention, my sense of smell is pretty sharp at all times and is currently at supersonic levels. I felt bad for Clementine (who knows what the heck she ate that's making her sick), but I couldn't stay in the house so I went outside in the snow and called David and told him we were in crisis mode at home and I was thinking about just taking the girls and fleeing. He (bless his heart) told me to do just that, so we loaded back up and went to eat dinner at Dairy Queen (healthy choices) and then went to Spanish. I spent their hour of Spanish class at the library, mostly talking to my mom on the phone in my car, and by the time we all got home, David had the house and the dog cleaned up and smelling fresh. Other than that sort of domestic excitement, we've just been doing the new semester routine stuff. Coco's new thing has been putting on a show for us each night. Mostly this means dancing to "Shake It Off" or "It's a Small World" (pick your ear worm!) and her dances include a lot of cartwheels and she's always wearing a princess nightgown for the show. Zuzu sometimes joins her and sings into the microphone and shows off some dance moves as well. It is highly entertaining. My next post will be a pregnancy update. This babe is already winning the Least Documented Pregnancy Ever, so I would like to do a post or two for posterity's sake. Meanwhile, I need to get back to Pride and Prejudice. May your day/week be healthy and stink-free. I have a list of things I want to blog about, and each subject seems long enough for its own post, but I feel like I should start with resolutions before we get any deeper into 2019. I should say quickly, thank you SO MUCH for the sweet messages I got about The Closer. I'll have more to say about that soon, but your support and enthusiasm and messages of hope and acknowledgement of fears... it means so much to me and it makes me feel like I can get through the next four months without losing my mind. Now, about resolutions. This year I'm doing something a little bit different, thanks to a new friendly acquaintance I know in real life and am following on Instagram. She introduced me to Kimberly Joy's Wheel of Intention, which she used last year for resolutions. I love this idea because it covers broad areas of life while also encouraging you to set specific goals. So rather than saying, "Practice self care," I can specifically tend to my mind by tackling Modern Mrs. Darcy's 2019 Ready Challenge. I also love it because it makes "Money and Career" one piece of a much, much bigger life pie, and it was really revitalizing for me to look at the division of my life and priorities like this wheel. I think that I tend to visualize my day with 2/3 of it taken up by work, and sometimes it starts to feel like work is 2/3 of my life--especially when I'm bringing home essays or exams to grade, or I am in bed reading for class rather than for fun. The fact is that some of that is unavoidable with my job--I'll always be cramming in grading time and there will always be evenings when I need to read for class. The trade off (and major perk) of my job is that it gives me a month off to do none of those things at Christmas, and a couple months off in the summer. And when I'm in bed reading for class, I'm still reading Jane Austen. - Yoga 5x a week. I was SO GOOD with daily yoga last year. And then the first trimester of pregnancy hit me and although I wasn't barfing in the morning, exhaustion and nausea were the main experiences post-alarm clock. So yoga went out the window for about six weeks. I did pick it up again, but I started worrying about doing something wrong/harmful (this is mostly just paranoia--I've never heard of yoga causing miscarriage). And exhaustion was still real. So I tried to do prenatal routines, but those were often too boring/easy. So I was a little stumped. I have a few videos now that I like and I've been having sciatic nerve pain, so I know I need to keep moving and keep my back strong. I should be able to get back into this. - Plan a 2020 vacation. 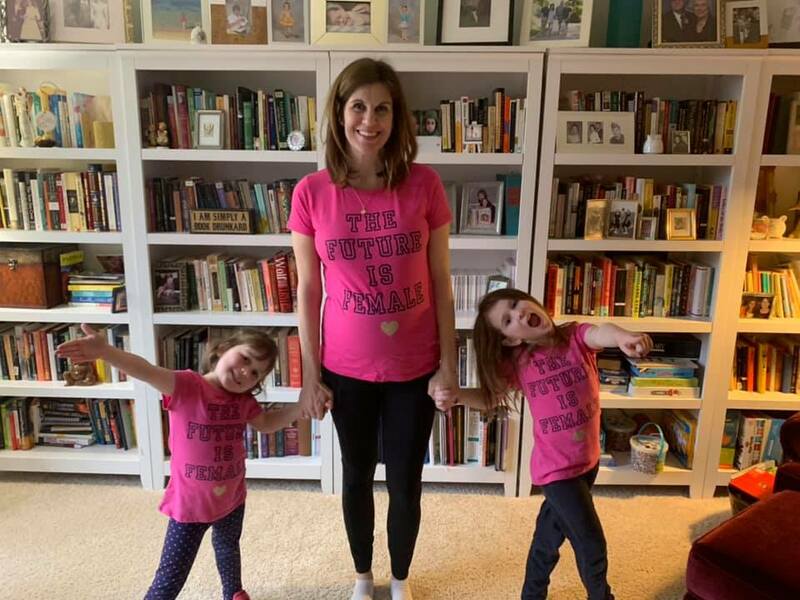 I'm not sure what this will look like... we'll (hopefully) have a second-grader, a kindergartener, and a baby, but I'd like to find a location that will suit all of us. - Encourage girls to craft. - Revisit (and revise) novel. - Host a game night. - Plan a surprise date for David. - Sign up for a new group/experience outside my comfort zone. I did buy tickets to see Rachel Cargle when she's in Kansas City, but I'm going with a friend and it doesn't feel scary. I recently applied to be part of a 12-week study of anti-racism work that's specifically geared to help white people take action. I want to be sure that I am prepared to do anti-racism work without burdening people of color or centering myself, so I think this study will be helpful. But 12 weeks? With a new group of people, none of whom I know? I hate new things. This is definitely outside my comfort zone. - Read three books in the genre of religion/spirituality. I'm still open to possibilities here, but I want to read An Altar in the World by Barbara Brown Taylor and Walking on Water by Madeleine L'Engle. So that's it... I have a few more bullet points under some of them, but you get the idea. I'm trying to be specific but still push myself to do things I might not normally do. If you want to download your own wheel and bullet your own goals, you can find it here. I have to say, I was feeling sooooo good about the new year a week ago. Last Saturday was 60 degrees and sunny. Zuzu and Coco and I walked the neighborhood so Zuzu could sell Girl Scout cookies and she made her (very modest) goal. The house was clean and I felt energetic and excited about preparing for the semester. I think maybe my absolute favorite part of the job is preparing reading lists and syllabi. I know that sounds lame, but it's just the time when the semester is full of joy and possibility, before the reality of unenthusiastic students and piles of gradings start weighing on me. Anyway, Saturday I was in a really good mood. Living on top of the world! Then Sunday morning was a drag to get everyone to church and by the time we got home from church, my back was killing me. I had sciatica like never before. I've experienced sciatic nerve pain in all of pregnancies (and there are so many of them because I apparently have the reproductive capacity of a hearty pioneer woman) but nothing has ever been this painful. I was reduced to tears a couple of times--going from bending to straightening, including sitting to standing, was excruciating. And there was a moment when I seriously thought I might pee my pants because I couldn't see how I would get up off the floor in time to make it to the bathroom (David ended up lifting me up). It was brutal. So Sunday was a sharp decline from Saturday's blissful, optimistic mood, and it's been a week of trying to get back to where I was. I used ice packs and heating pad and gentle stretches and saw my chiropractor Monday morning, but this has been a week of recovery. I've come to appreciate the struggles of those living with chronic pain. It makes me so short tempered! Plus my jaw hurt from gritting my teeth. After a week, things have definitely improved, but my back is still not what I would call normal, even for pregnancy. So that's a work in progress. But the day stretched on and on and morning was long gone and bedtime was a long time away and the house was a mess, the kids were having meltdowns, my back was killing me... Let's just say the charm had worn off by 5pm. I'm ready for a restart tomorrow. I think that's what I like so much about resolutions. They are a chance to restart. They create a picture of the person I want to be, and I may not hit every mark in 2019 (although I really try to make them achievable!) but I can always strive to learn more, to do more, to be better. And I guess that's also the point of every morning--not just January 1. Here's to tomorrow--may it be filled with more patience, less pain, more laughter, less whining, more music, less bickering, more hugs, and fewer meltdowns. Happy 2019 everybody! This post needs a trigger warning: if you are sensitive to reading about pregnancy (including pregnancy after loss), you'll want to skip it. If all goes well (important caveat), we are expecting another baby in May. You may be shocked reading this, which is understandable as we didn't exactly think this was on our agenda. Full confession is that last spring I did start to think that I would be open to having another baby. I told a couple of friends that if I could be guaranteed healthy baby at the end of it, I could maybe do another pregnancy. But, Real Talk, the anxiety and uncertainty of another pregnancy (plus a pregnancy at 37-going-on-38) felt like too much to handle. So David and I decided that we were finished having babies and we were putting that stage completely behind us. And honestly, I'd already given ALL of my baby stuff away to my brother and sister-in-law. And then I noticed that I couldn't get through a cup of coffee in the morning because it tasted disgusting and eventually I peed on a stick. And this time I ponied up for the digital kit because I was NOT going to be squinting in my bathroom at a hazy pink line. Just give me the digital word(s) already. And then there was just one word: Pregnant. Now? I'm still pretty scared. I'm almost 20 weeks along and I think if I were a reader maybe I will feel annoyed or kept out of the loop, but I'm not trying to be tricky here. I haven't mentioned it because I truly kept waiting for things to go sideways. I am still quite worried about the 20-week scan next week, even though our genetic testing came back clear and we don't have any specific reason to worry (except, you know, for all those 1% risks that something will go wrong and our baby will die). I kept thinking I'd announce it after the first trimester, but then we were right at Eliza's birthday, and I just needed to get through that anniversary and then it was the holidays. But I don't want to feel like I'm keeping it a secret. It feels both like an embarrassment of riches and also like the bottom will drop out from under me at any moment. I think my mental health is pretty good this time around. I'm mostly operating in a mode of cautious optimism. But also I was shocked when I saw Instagram pictures of a pregnant friend of mine taking her seven-year-old daughter to an ultrasound visit. I couldn't believe she'd done that. You see, it would NEVER occur to me to do this with Zuzu and Coco because I fear that every ultrasound will show a dead baby. And when I say that, I don't mean "Oh, every pregnant woman worries." I mean, "I could never bring my daughters to a doctor appointment with me because I am absolutely convinced before each appointment that my baby will not have a heartbeat." So probably that's not exactly normal. I do have the same wonderful OBGYN and I'm hopeful (see that cautious optimism?) that this pregnancy will be just like Zuzu and Coco and end in a gorgeous little human. But it does feel like we have a long way to go. As my friend Sarah kindly reminded me, planning for and talking about a baby is not a cause of pregnancy loss. But when your baby dies before she is born, causation and correlation get really murky. I have braced myself to see blood every single time I have peed since I peed on a stick and saw two pink lines back in October. That is a lot of trips to the bathroom. I actually had a moment when I saw a tiny spot of red blood after I wiped and I immediately went into cold panic before realizing that I had a paper cut on my finger and it was bleeding on the toilet paper. 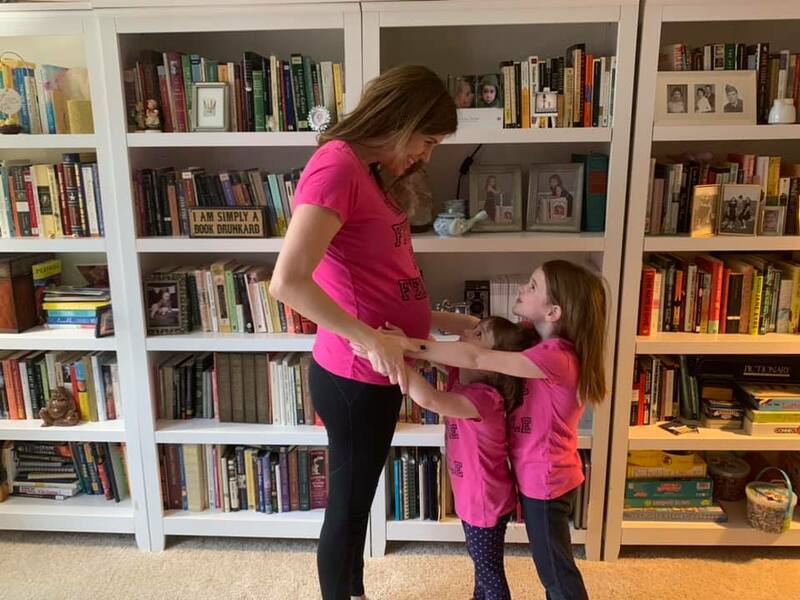 The girls are excited, and I'm trying to let that buoy me rather than terrify me (it's far too easy to imagine their grief and disappointment should we lose this baby). Based on all the evidence we have, this baby should be fine! Based on personal experience, I'm looking at a 33% chance of disaster. Feels more like 50/50. Also, statistics are meaningless when it's your life, your pregnancy, your baby. I spent the first trimester trying to convince myself that the status quo was awesome and if I miscarried, we'd be fine. But really you guys I'm all in. I'm ridiculously, breathlessly excited about one more squishy baby duck. I look at baby pictures of Coco and Zuzu and I can't believe I could be lucky enough to get one more of those gorgeous babes. AND I'm also really scared that there's just not enough luck in the universe to get me there. So that's where we sit as 2019 unfolds. 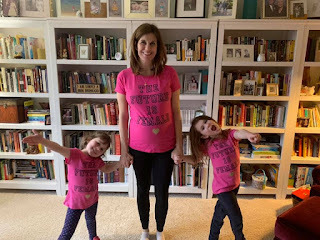 I have a lot more thoughts on this pregnancy (of course), but I just wanted to fill you all in (I think there are still a few people reading this!) and maybe I'll post an announcement on IG and FB soon. It's just hard to get the tone of those right... cautiously optimistic and super freaking excited and also totally effing terrified. How exactly do you communicate that in a bump photo and a caption? I'll let you know if I figure it out. In the meantime, thanks for reading and following along with us. Every comment (except the few dickish ones and all those anonymous spam bots, obviously) has meant so much me. Some of you have been reading since we had Baby Duck, The Deuce, and Rerun. And now, here we go again on our final round with The Closer. Where to even begin with the Disney post? It was a delightful trip in many ways, there were definitely a few things we'd do different next time, and lots of highlights. 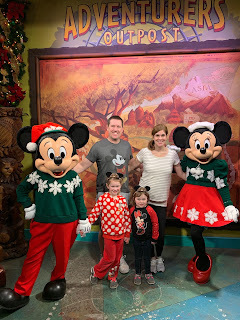 We went to Epcot, the Magic Kingdom, Universal Studios, and Animal Kingdom. 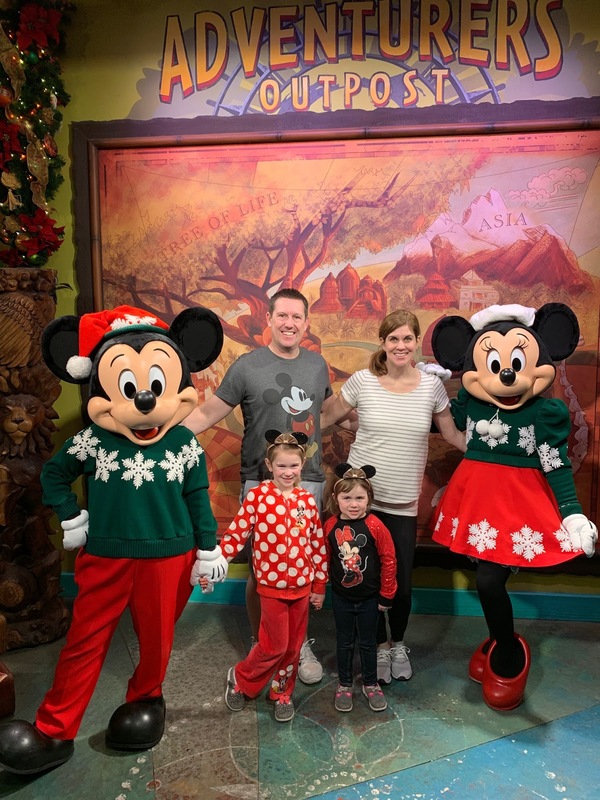 We visited Epcot, Universal Studios, and the Magic Kingdom twice. Here are my thoughts and reflections, in no particular order except what pops into my head as I'm writing this. - Epcot was one of my favorite parks, and we only got to see it after dark (our first day) and in the rain. This was a bummer, as far as I'm concerned. Next time, I would skip going to a park the evening that we arrive. We were up at 6am to leave for the airport by 7, which is not ungodly early by any means, but a day of travel with two little ones is exhausting and stressful, even though we ended up gate checking our carry on suitcases so we only had backpacks to worry about. We were all just a little too tired to really enjoy our experience at Epcot, which was overwhelming and disorientating in the dark with all the crowds after a long day of travel. 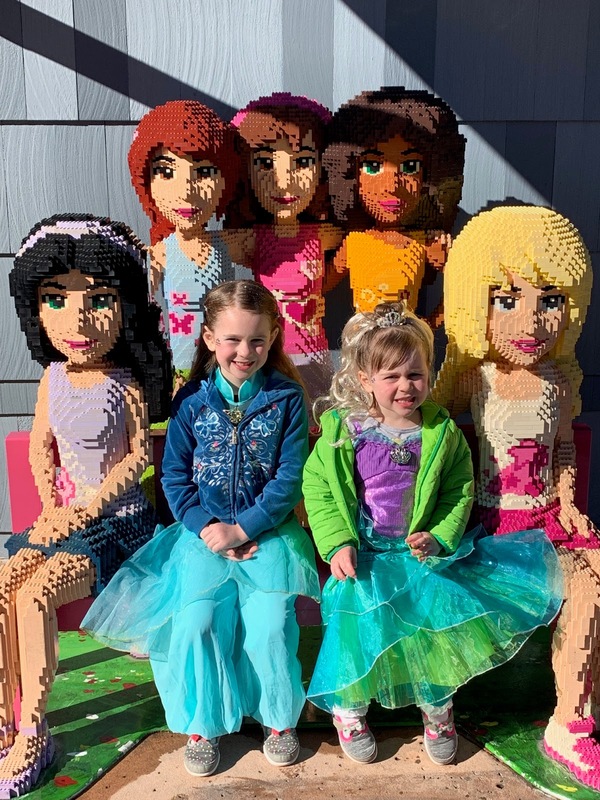 - Six is a pretty perfect age for visiting Disney. Four is good, but doesn't quite have the stamina or height or six (and is still prone to the occasional meltdown). Zuzu was charming and delightful the entire trip, and Coco definitely had moments of expressing that she was tired and out of sorts. She still naps at school (and occasionally at home) and we were pushing through naptime everyday. She's not a kid who sleeps in the stroller (except one night on the way home). So maybe waiting another year would have been good for her, but I have no regrets about taking Zuzu at age 6 1/2. 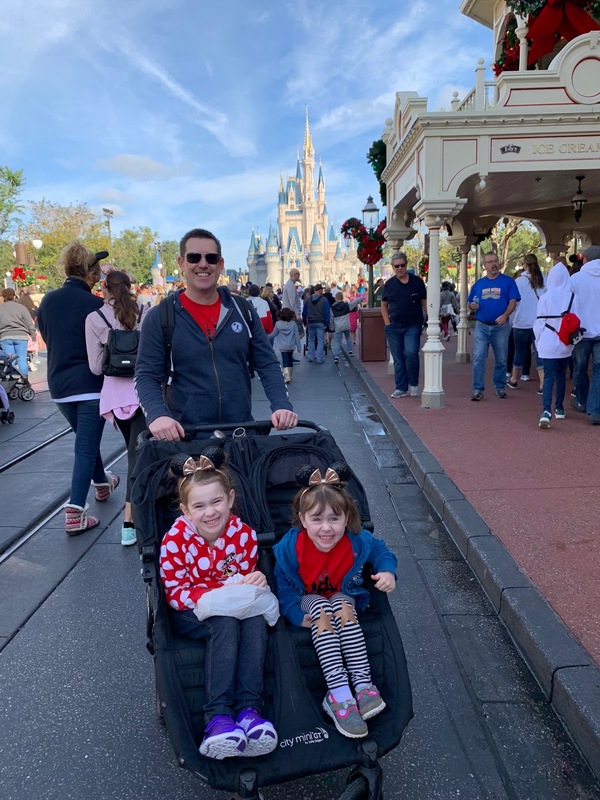 Also, we used our double stroller, which was definitely the right call (we have this one and have been very happy with it for the past four years). Coco gives Dole Whip a thumbs up. - Rain is the worst. There's just no way around it. It kept the crowds down for sure, but it made for a chilly day with soggy feet, which was pretty miserable. We kept our game faces on, but I do not like being wet and chilled. We tried to time our visit around showers, but there was rain on and off all day long, so we got to the park later than we would have and left earlier. 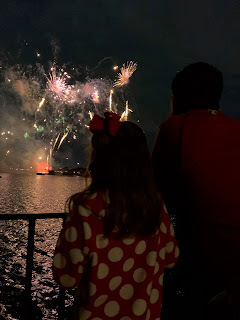 We showered and ate at the hotel and then the rain had let up, so we went back to Epcot for the fireworks show and a couple of fast pass rides, which was nice. - Fireworks with our kids is overrated. David wanted to push several park visits to 9:30 or 10:00pm when the fireworks shows starts. I know Disney fireworks are awesome. But Coco still doesn't like the noise (I spent the show covering her ears with my hands) and it's just not worth it for us. I'm glad we saw the fireworks at Epcot one night, but that is all we needed. 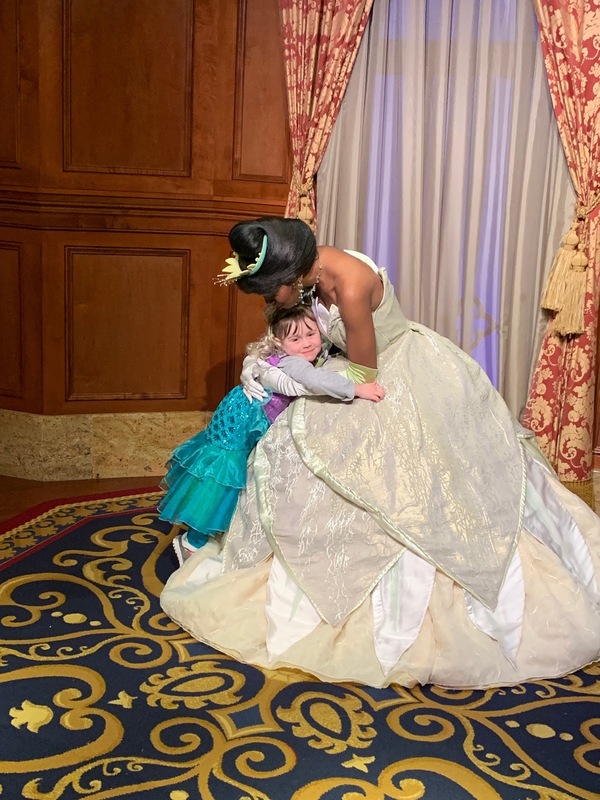 - The magic of princesses is real. 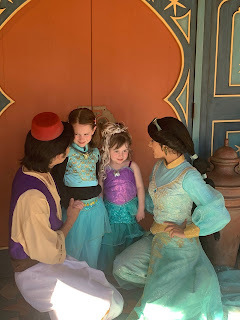 The cute conversations that each one of the princesses had with our girls, their star-struck smiles and shyness, the big hugs they gave after having their photos taken--it was all so adorable. 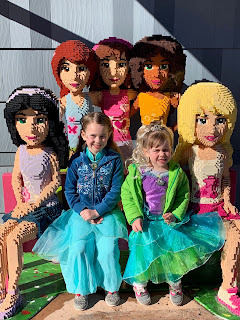 - The Bibbiddi Bobbiddi Boutique is a racket and is TOTALLY worth it if your kids are into that kind of thing. Coco in particular was so delighted with the long blond hair piece that she selected--that alone was worth the cost. We were running late for our appointment because we didn't realize the shuttle bus from our hotel didn't start running to Disney Springs until close to 9am and our appointment was for 9am, but they were totally sweet and accommodating (as I suppose you would expect from a fairy godmother). It was a real highlight of our trip. - We stayed at the Dolphin hotel of the Swan and Dolphin hotel complex. This is apparently a Disney-owned resort, but is not considered to be "on property" as their other hotels are, although it is walking distance from Epcot (if you don't mind a bit of a walk) or you can take a quick boat taxi ride (for free) that drops you right at Epcot. They also have frequent bus shuttles to all the parks and to Disney Springs (though Disney Springs does not run as early as the parks do, as we learned). I have no complaints about our hotel--our room was spacious (two double beds) and very clean, the pool at the hotel was lovely, and there were several restaurants and a little cafe/grocery/candy store on property where we picked up cereal and yogurts for breakfast. I don't know anything about booking Disney trips, but David said the cost per night was considerably less an "on-property" hotels and we had zero complaints. They also provided complimentary heavy-duty umbrellas for guests on the rainy day we had, which was a real lifesaver. - We had pizza delivered to our room one night, which was such a good choice. Our kids did pretty well in restaurants each evening, but a pizza picnic mid-week was exactly what we needed. - We (and by "we" you all know I mean David) really tried to do a bit too much. We were there for six days and the plan was to go go go. I told David that I wished we had splurged for Mickey's Very Merry Christmas party, but he wasn't willing to shell out the extra cash. I think it would be worth it in December, though, to experience the park with fewer people. My understanding is that the week between Christmas and New Years is the busiest of the year, but the week before Christmas was definitely hopping. So I would have chosen to do that, but David disagrees, so there you have it. (You all know I'm right.) We definitely played it right taking an afternoon midweek to leave the park early and let the girls swim at the hotel. - We could have done some optional early hours apparently, but we didn't. Forcing yourself out of bed at the crack of dawn when you and your children are not naturally early risers just didn't feel worth it, although I suppose that's another (less expensive) way to be at at the park with fewer people. - Fastpasses are great. 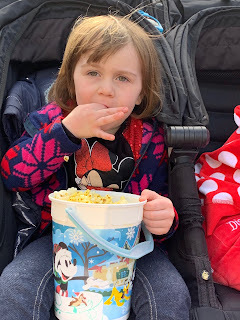 We only went on a few rides without fast passes, and those waits got to be pretty brutal (mostly because we had to keep Coco somewhat entertained while she whined about how it was taking forEVER). - The Haunted Mansion is scary and traumatizing if your kids are sensitive about that kind of stuff, so just skip it rather than wait in line and then feel terrible that your four-year-old is crying the whole time. 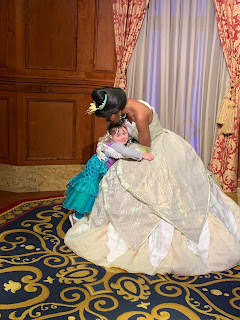 - Honestly, Coco got to where she didn't want to go on any ride that got dark (which is a LOT of them) and anytime we were in a tunnel (scary or not) she would say loudly, "When do we get out of here? When is this over?". 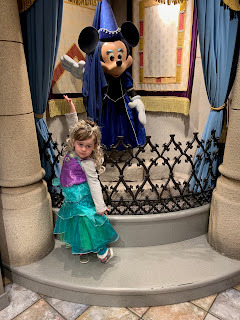 She loved the princesses and Mickey and Minnie and the kiddie roller coasters, but honestly, she probably would have been a lot more fun a year or two from now--in part because she would be tall enough for some of the rides that she couldn't do this year (and in part because of her more cautious personality). It's hard being 38 inches tall at Disney! - Next time I would do a grocery delivery or bring more snacks with me. You can bring food into the parks and Coco is such a grazer. She wants small snacks frequently through the day and she is crabby AF when she is hungry (I wonder where she gets that...???). We bought a refillable popcorn bucket for $10 the first day and refilled it at least once every day for $2. It was definitely a good investment for our popcorn-loving family. - David's mom gifted us with a photo package so anytime we saw a Disney photographer at the park, we could have them scan our card and take a family photo. This was fun, even though I did not feel cute at all the entire time we were there, and we have over 300 photos to sort through and download. I wasn't sure we wanted to shell out for the photo package, but it's the best way to get all four of us in the photo, and it was a perfect Christmas gift. - Similarly, we got Disney cash cards from my aunt and from some of David's coworkers, which was so thoughtful and appreciated. We put those toward food at the parks and a souvenir Christmas ornament. 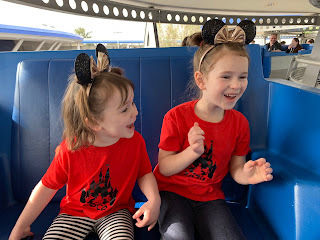 - I bought Minnie ears on clearance from Gap.com months before our trip, which was great because the girls were excited about them, but when the novelty wore off, I wasn't mad that I'd spent $8 instead of $30 on the ones at the park. 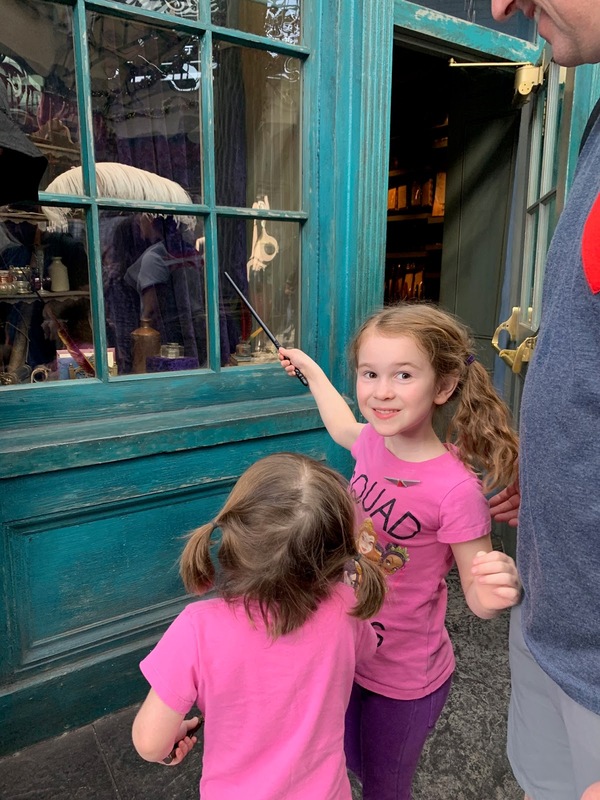 - We spent two days at Universal Studios which was one day too many for our family. I know some kids are totally into Dr. Seuss and Marvel superheroes, but we were really just there for Harry Potter. We started our days in those areas and then ventured out to the rest of the park when the crowds became impossible. We should have done a one-day ticket for both parks and would do that next time. The coolest rides are too scary or intense for our kids, and Zuzu wasn't interested in trying Spiderman, even though David tried to convince her. They had a lot of fun on the playground areas where they could climb and slide, but next time we'd spend less time there just because of our kids' particular quirks. I'm sure there's more, but honestly we had the best time. Don't believe Coco's face in the photo above! I hope that the girls will remember the trip being magical and exciting. Their joy made the trip joyful for us, and that was the real magic. It was a lovely way to wrap up 2018, and such a perfect trip for this moment in our lives. David gets huge credit for doing all the planning and the coordinating. I seriously had no idea what was going on until he told me, and I'm kind of proud of myself for being chill enough to just go with it! (I did have to talk him in to taking a half day one day at Universal so we could go back to the hotel and let the girls swim--he's a go-getter, that one!). 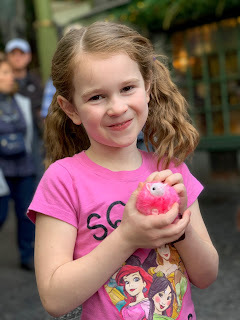 Just looking back at these pictures and the expressions on the girls' faces when talking to the princesses or going on the rides (or getting the same pink pygmy puff as Ginny Weasley) makes me so happy. Other fun things... I went back and forth about this, but finally ordered matching family shirts (I got them from a seller through Jane.com). 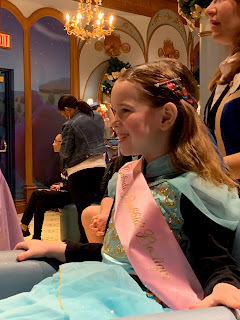 I also got the girls everyday dress up dresses--they are dresses that mimic the Disney princesses, but are made of soft, knit material so are more comfortable for wearing than the sometimes stiff and kind of itchy, shiny dress up dresses (which my kids also have and love). I bought their Ariel and Jasmine costumes from the Disney Store online before the trip, rather than buying them at the Bibbiddi Bobbiddi Boutique, which was definitely a cost saver. I found a great falafel and hummus place between Africa and Asia in the Animal Kingdom, which we had for lunch one day, and we also loved our pasta meal at the Lady & the Tramp restaurant (names are escaping me) on Main Street at Disney World. Oh--and I ignored David and wore my winter coat most days with no regrets. 60 degrees is not cold, but mornings don't start out that warm, and when it got dark, I was glad I had it. It was nice to be able to stuff it under the bottom of the stroller when I didn't need it. 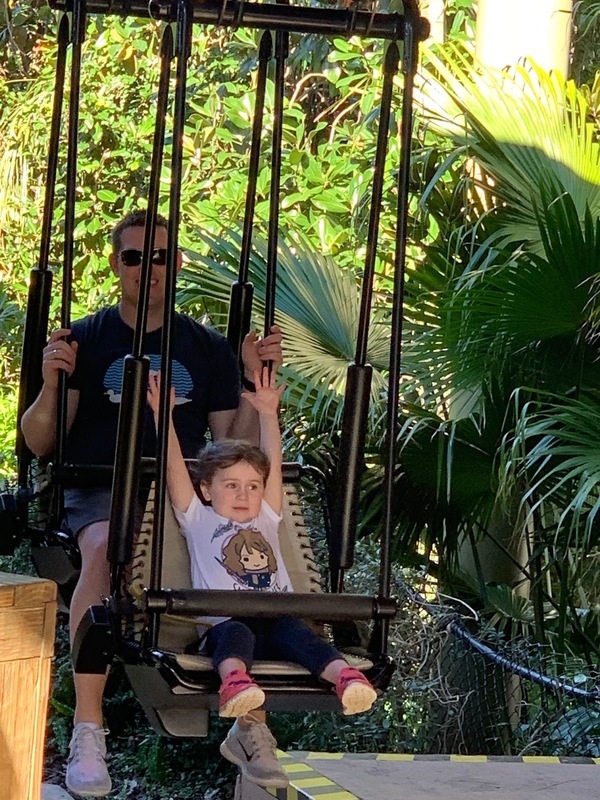 One other thing I'll add--and really, the only piece of advice I have--is that David paid for some kind of app that helps you set up an itinerary and tells you how many people are at the park and how long lines are for specific rides. It was definitely worth it--he consulted it a lot and since we weren't familiar with any of the parks, it made planning much easier. If I'd been in charge, we would have just had someone else plan the trip for us (haha but seriously), but if you want to micromanage the details, find an app that helps you! A Lesson Learned; or, Suppositories Go Where?